Our 10,000-square metre manufacturing facility with large height clearance and dual 20 tonne double girder overhead cranes means we have the facilities, equipment and the muscle to tackle any job. 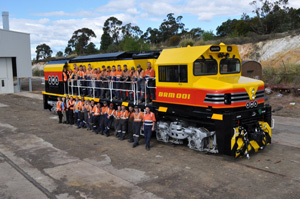 In addition to providing locomotive and wagon manufacturing, we are also adept in all aspects of locomotive maintenance and rollingstock maintenance to ensure that your assets are working reliably and efficiently. As a rollingstock manufacturer and specialist rebuilder, SSR offers customer-oriented solutions with a broad range of products for standard and specialised needs. Every project is undertaken with the utmost attention to our high standards of quality and safety. With the skills and capabilities to perform a variety of complex manufacturing jobs, SSR undertakes everything from rollingstock and passenger car upgrades to large and extensive new build locomotives and wagon manufacturing. We have also completed various rollingstock conversions to customer-specific specifications and we have the potential to build new rollingstock on an order-by-order basis for customers that require specific product outcomes and flexibility. When you require rollingstock maintainers that are efficient, professional and experienced, the team at SSR offers a wide range of capabilities that are suited to meet every individual client’s requirements. In addition to our experience in locomotive maintenance and rollingstock maintenance, we also offer comprehensive services in locomotive and wagon manufacturing and upgrades.